1.4W 6W 8W 11W 13W are available. 3.unique design,ultra slim led 2pin housing. 4.compatible with electronic ballast,magnetic CFL ballast or ballast bypassed. 5.Replace CFL halogen G23 lamp 13w,replace LUNERA HELEN lamp directly. 1.GX23 led lamp 6w is effective lighting, excellent heat dissipation, more safe. 2. Lamp shade with acrylic material of antistatic processing. 3. Chip with high lumen SMD2835, more natural lighting. 4. 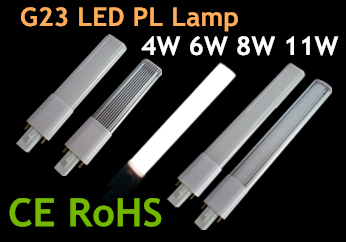 G23 led pl lamp is low power consumption,longer lifespan. 5. Comfortable visual sense, no flash, no glare, no IR radiation. 6. G23 led bulb is easy to install, environmental protection. 7. Some items can support trac dimming function. 8. g23 2-Pin CFL socket supports dimmable function, 0~100% dimming range. 9. G23 GX23 2G7 base available, g24d(2 pins) and g24q(4 pins) for your optional! g23 2 pin led lamp is widely use in home, shopping mall, supermarket, hotel, school, meeting room, and other inner places to replace the cfl lamps!